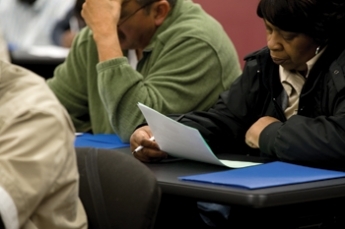 Job-seekers fill out paperwork at the Garfield Workforce Center. Despite serving communities that have some of the nation's highest rates of long-term unemployment among young people in the country, the center has worked with a comparatively low number of people. Photo by Joe Gallo. The door to the Garfield Workforce Center opened promptly at 9 a.m. on a rainy spring morning. The job seekers who had formed a line outside the office walked past a purple flier advertising jobs working for the U.S. Census Bureau. About half a dozen job-seekers at the nearby computers sought to replicate the man’s success. If past results are any indicator, however, that goal is going to be a hard one to reach. The Garfield Workforce Center is one of five workforce facilities located throughout the city. From 2006 to 2009, 2,660 people from the center were served through funding from the Workforce Investment Act, a framework and major source of funding for the nation’s workforce development system. That figure is the second lowest of the city’s five centers and 41 percent lower than the 3,745 people served through the Southwest Workforce Center, located at 7500 S. Pulaski Road in the city’s West Lawn neighborhood. The lower numbers are not due to a lack of unemployed people. In 2008, 52 percent of people ages 16 to 30 in East Garfield Park, Humboldt Park, North Lawndale and West Garfield Park had not worked during the previous five years or longer. By contrast, the Southwest Workforce Center is located in a group of neighborhoods that includes Chicago Lawn, Clearing, Gage Park, Garfield Ridge and West Elsdon. In 2008, 34 percent of these communities’ people ages 16 to 30 had not worked during the previous five years or longer. Leigh Diffay, the Garfield center’s regional director, attributed the service disparity to the fact that the center tends to attract many people who are difficult to place. A lot of the job-seekers have criminal backgrounds, are homeless, are grappling with mental illness, are single parents or some combination, he said. “There is a disconnect between the workforce jobs that are available and the skill sets customers have,” he said. “Those workers that have marketable skill sets are not coming to the Garfield Work Center. “All of the centers serve people who have similar needs, but the Garfield Center serves a higher percentage of people who are homeless or ex-offenders,” Diffay said. Diffay said his conclusions were based on anecdotal impressions and the city’s funding a program specifically for ex-offenders in 2007 through 2009. Diffay explained that the city distributed brochures to let residents know about the five centers and their available services but did not provide any other resources to publicize the activities of the center. Anne Sheahan, spokeswoman for the Chicago Department of Family and Support Services, said her agency did not have any information on how much it spent on publicity. Whatever the expenditures are, the word has not appeared to circulate in some West Side communities, according to Derek Brown, a former high-ranking Vice Lords member who has started a boxing program at Penn Elementary School to help North Lawndale’s children. Brown said he knows dozens of chronically unemployed men in the neighborhood, but few of them have heard about the 10 S. Kedzie Ave. office. For his part, the Rev. Robin Hood called the citation of clients’ skills and insufficient funding for publicity a copout. “They’re getting funding and not getting the message out,” said Hood, pastor of Redeemed Outreach Ministries and an activist on the city’s South and West Sides. According to a Chicago Reporter analysis of 2008 census data on employment, the group of neighborhoods that included East Garfield Park, Humboldt Park, North Lawndale and West Garfield Park had 30,317 jobs for its 137,350 residents–”or about 220 jobs per 1,000 residents. This figure was 17 times lower than the 3,720 jobs per 1,000 residents in the group of communities that included the Loop. But it was slightly higher than the 180 jobs per 1,000 residents of the Chicago Lawn, Clearing, Gage Park, Garfield Ridge and West Elsdon area.